Hey guys! I'm hosting this month's edition of Food 'n Flix! This month I'm challenging you to watch Kung Fu Panda (either or both), and then head into the kitchen to make a dish inspired by the film(s). I can't wait to spend some time with one of my favorite foodies, Poe! 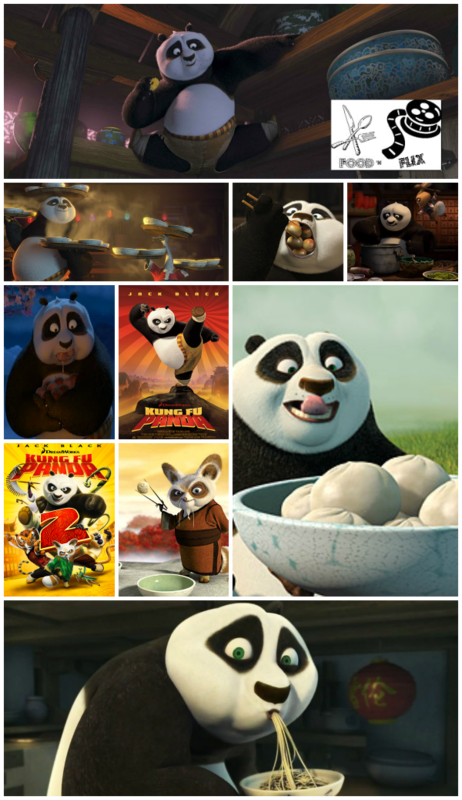 I adore both versions of Kung Fu Panda, and they just so happen to be very foodie-friendly. Watch the chosen film (Kung Fu Panda - 1 and/or 2). Taking inspiration from the film, head into the kitchen and cook or bake or make something. Post about it on your blog with a link back to THIS post and a link to Food 'n Flix. Use of the logo is optional. You must post must be current (posted THIS month). And of course we don't mind if your post is linked to other events...the more the merrier. *watch for the roundup to be posted Tuesday April 29th! Anybody with a blog is welcome to join us, and please feel free to ask any questions that you may have! I can't wait to see what you come up with. p.s. - if you haven't watched the special features on the Kung Fu Panda 1 dvd, I highly recommend doing so. There is an awesome demonstration on how to make your own noodles hosted by Alton Brown!